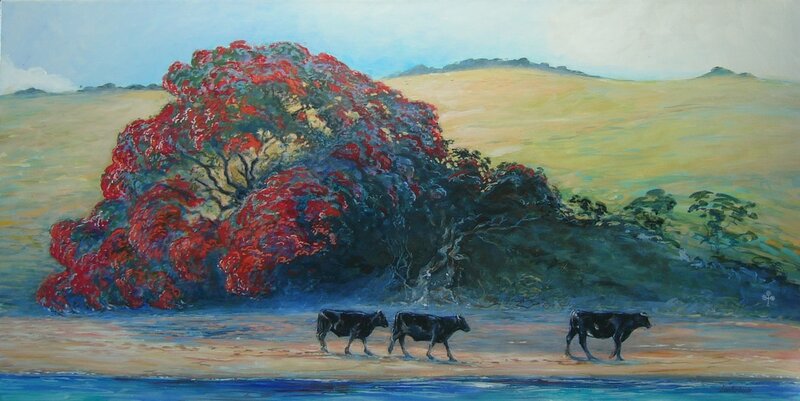 For more than 30 years, I have lived and worked as an artist in the Eastern Bay of Islands. The focus of my work for most of that time became the world of the Maori people. My wife and I have lived at Mt Tiger road since 2014 and we absolutely love the spectacular Whangarei Heads area. I was strongly influenced by my close friend, artist Friedensreich Hundertwasser and his principles and vision as an ecologist, philosopher, architect and artist. During the years of my studies of fine art in Germany, I painted cows, predominantly large scale canvases. My fascination for these beautiful animals has not diminished here in New Zealand and I often portray cows as part of our New Zealand identity. My studio is open for visits by arrangement and during the Whangarei Heads Arts Trail Easter weekend period. I have also a range of low-priced prints of some of my paintings as well as postcards available at my studio.